Eating disorders are complex diseases, and they do not exist in a vacuum. Unfortunately the co-occurrence of multiple mental illnesses is rarely discussed. Those struggling with multiple disorders should know that they are not alone, and should pursue treatment that addresses all of their conditions. 1 Mangweth, B., Hudson, J. I., Pope, H. G. Jr., Hausmagn, A., DeCol, C., Laird, N. M., …Tsuang, M.T. (2003). Family study of the aggregation of eating disorders and mood disorders.Psychological Medicine, 33, 1319-1323. 2 McElroy, S. L. O., Kotwal, R., & Keck, P. E. Jr. (2006). Comorbidity of eating disorders with bipolar disorder and treatment implications. Bipolar Disorders, 8, 686-695. 3 Altman, S. E., & Shankman, S. A. (2009). 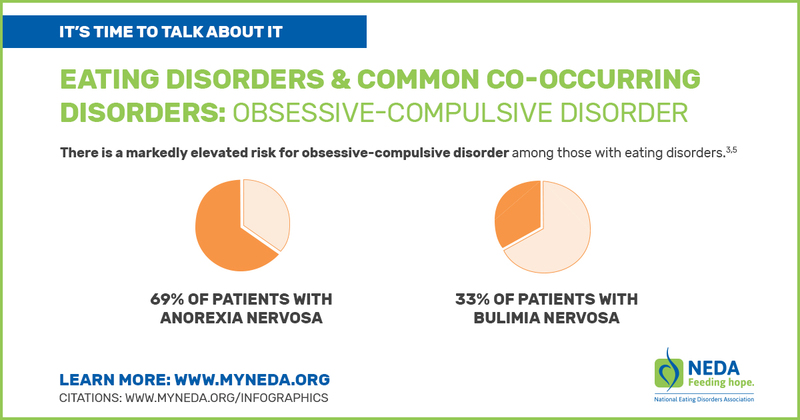 What is the association between obsessive-compulsive disorder and eating disorders? Clinical Psychology Review, 29, 638-646. 5 The National Center on Addiction and Substance Abuse (CASA) at Columbia University. Food for Thought: Substance Abuse and Eating Disorders. The National Center on Addiction and Substance Abuse (CASA) Columbia University; New York: 2003. 6 Hudson JI, Hiripi E, Pope HG Jr, and Kessler RC. (2007). 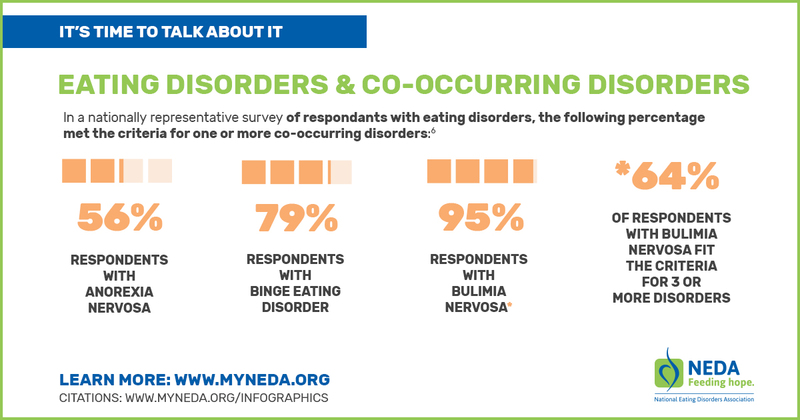 The prevalence and correlates of eating disorders in the National Comorbidity Survey Replication. Biological Psychiatry, 61(3):348-58. 8 "NIH Categorical Spending -NIH Research Portfolio Online Reporting Tools (RePORT)." U.S National Library of Medicine. U.S. National Library of Medicine, 3 Jul. 2017. Web. 11 Jan. 2018. 9 Milos, G., Spindler, A., Buddeberg, C., & Crameri, A. (2003). Axes I and II comorbidity and treatment experiences in eating disorder subjects. Psychother and Psychosom, 72(5), 276-285. 10 Ulfvebrand, S., Birgegard, A., Norring, C., Hogdahl, L., & von Hausswolff-Juhlin, Y. (2015). Psychiatric comorbidity in women and men with eating disorders results from a large clinical database. Psychiatry Res, 230(2), 294-299.